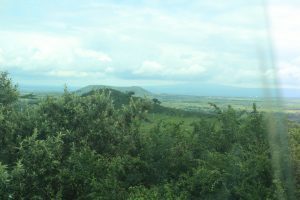 After an early departure from Kisumu this morning (6 a.m. to be exact) we were on the road to Nakuru. It was about a 5-hour drive with all of the construction and traffic of the roads. I think we all are becoming a little more accustomed to the roads and driving in Africa. Our first few days here all of us would be wide awake and sitting on the edges of our seats wondering how our drivers, Benson and Wilfred, would make it down these roads. The roads are so skinny and it is a rare treat if they are paved! Potholes, bicycles, motorcycles, donkey carts, and fellow “matatus” are just a few of the obstacles we go through each day on the road. But by this point in the trip, we all have grown to trust our dear drivers and know that we will get to where we need to go when we are in the hands of Benson and Wilfred (and the Lord). So needless to say, most of us slept for that 5-hour drive, through the bumps and all. We stopped when we were about halfway for breakfast, which was chai and mandazi. This is comparable to a Dunkin’ Donuts stop for coffee and donuts. After our quick breakfast we were back on the road. 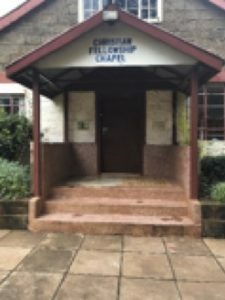 Two hours later we arrived at Lake Nakuru Lodge where we were greeted in the lobby with hot towels and a glass of mango-pineapple juice. (Dad, you would love it here!) It feels like we are in another world at this lodge. We are staying three to a “room” but it is more like a little suite. Each room has a small back porch, which looks out onto the African landscape. Speaking of which, while sitting on our porch today, Patty, Rachel and I were taking pictures when all of a sudden a pack of baboons came running through the grass about 2 feet in front of us. We ran back into our room and shut the glass doors as two baboons jumped onto our porch and started to stare at us, maybe hoping for a bit of food. After that ordeal, we walked briskly to the restaurant in the lodge where we served ourselves an African buffet complete with tropical juice to drink and homemade mousse and cake for dessert. What country are we in again?? Oh yeah . . . Kenya . . . Africa. It is easy to forget where we are, the few times we have gotten to eat and stay at these extravagant places. 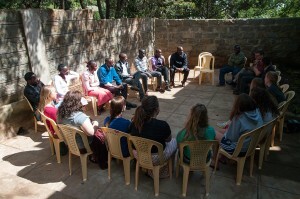 It is funny—we have only been here for two weeks yet we already feel accustomed to Kenya. Whenever we go to places that are touristy all of us kind of stare at the other people and think, “Huh! Look at those tourists!” Even though we are one of them, it doesn’t feel like it. I think because most of our experiences have been interacting with people at church, schools and in the towns we visit, it feels odd when we do “touristy” activities. But this girl is thankful for the tourist day we had! We went on two safaris today, one before lunch and one after lunch. Let’s just say, out of “The Big Five” we saw three! The Big Five includes: lion, leopard, rhino, elephant, and buffalo. We saw a herd of buffalo almost right away. They are pretty common to see. What we all really wanted to see was a leopard and a lion. Little did we know our wish would come true! We were driving along when Benson heard on his radio that there was a leopard in a tree up ahead about 2 kilometers and that half of its kill was hanging from the tree. Benson sped up, and there was not just one leopard, but three! They were all spread out just lounging in the tree after having eaten half of an impala. And yes, the other half was still hanging halfway up the tree trunk. We were all so excited to see the leopards . . . but this day just kept getting better! 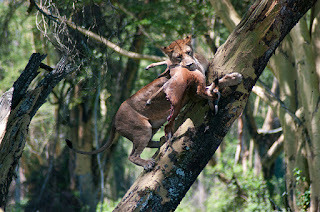 All of a sudden a lioness popped her head up from the brush and made her way over to the tree with the impala carcass. She scoped it out and then scaled her way up the tree trunk, ripped the carcass down and carried it off into the bushes. It was such an amazing moment to watch and the fact that we got to see two such powerful creatures all in a moment was so overwhelming. On our second safari we saw jackals, gazelle, more buffalo and a herd of giraffe. We ended the day watching the sunset over the fields as we drove back to the lodge. A lot of us kept saying to each other, “Is this real life? Did we really just go on a safari and watch the sunset in Africa and see lions and leopards and giraffes?” This whole trip has been such a blessing and we are all so thankful for the experiences we have had. Amazing! Patty, can you make me some Kenyan chai when you get home?